Microsoft Dynamics AX is the ERP solution for enterprises that provides a purpose-built foundation across five industries, along with comprehensive, core ERP functionality for financial, human resources and operations management. It empowers your people to anticipate and embrace change so your business can thrive. All of this is packaged in a single global solution giving you rapid time to value. Multiple, purpose-built industry and operational capabilities in one solution. Global solution that includes business management support for operations in 36 countries (country-specific functionality available in a staged rollout). Ad hoc reports and streamlined workflows with a Microsoft Dynamics RoleTailored user interface. Natural modeling to continuously plan, visualizes, and changes your processes. Flexible deployment options (such as two-tier ERP) that can change as you grow. Agile technology that makes it easy to change and differentiate your business. Drive user involvement and innovation with a business management solution that is simple to use, deploy, manage and deliver easy access to data and processes. 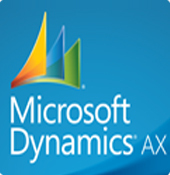 Microsoft Dynamics AX offers deployment options that give you choice today and flexibility in the future. Deploy on-premises or with cloud solutions that may reduce your upfront investment. Implement your solution all at once, or in phases according to your needs. Adopt a two-tier ERP strategy where Microsoft Dynamics AX is integrated with your corporate-wide ERP system. Microsoft Dynamics AX is highly scalable and compatible with the technology you already use, so that it delivers long-term value without high costs down the road. Our ongoing commitment to innovation means you are investing in a business platform that will always keep you on the forefront of what's ahead. Microsoft Dynamics AX is localized, translated, and supported by Microsoft and made generally available in select countries and languages. In addition, Microsoft channel partners may make partner-created localizations and/or translations of Microsoft Dynamics AX available in countries where Microsoft does not provide a localized or translated version.